The azaleas and dogwoods are in bloom, thunderstorms have started rolling through in the afternoon, and sunbathers and hammock dwellers have returned to their regular spots on Landis Green, which can only mean one thing: spring has arrived in Tallahassee! While the weather and native plant life hasn’t changed much in the past 70 years, fashion sure has. 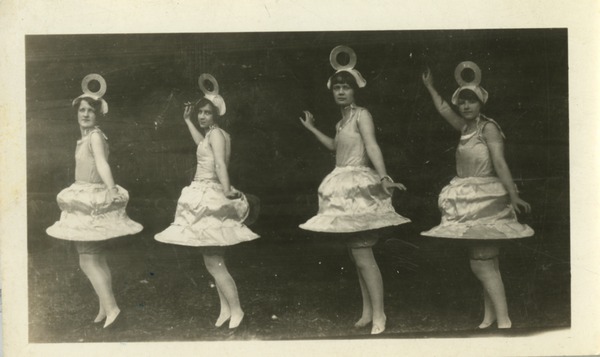 Take a look at some FSCW Easter styles, which in true southern fashion was all about white shoes and big hats. My Easter Hat, Mary Tarver Willis Photograph Collection (HP 2009-043), 1948-1951. FSCW Student Government Bulletins are now available in the FSUDL! 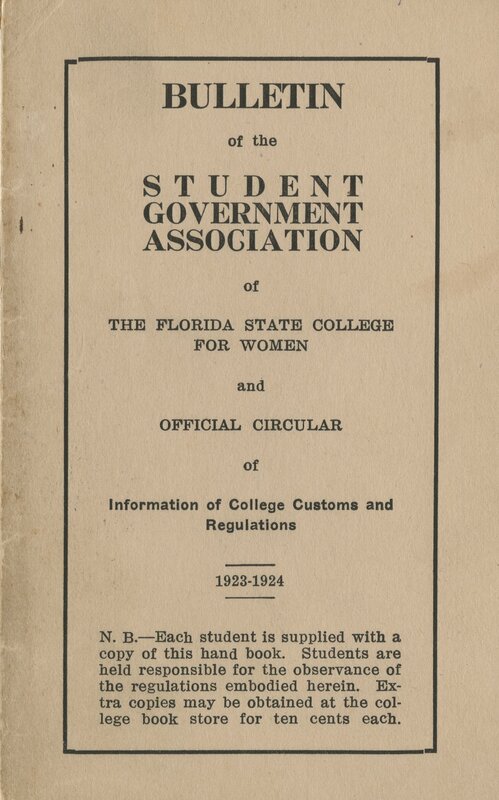 We are excited to announce that a set of Florida State College for Women (FSCW) Student Government Bulletins are now available in the Digital Library! 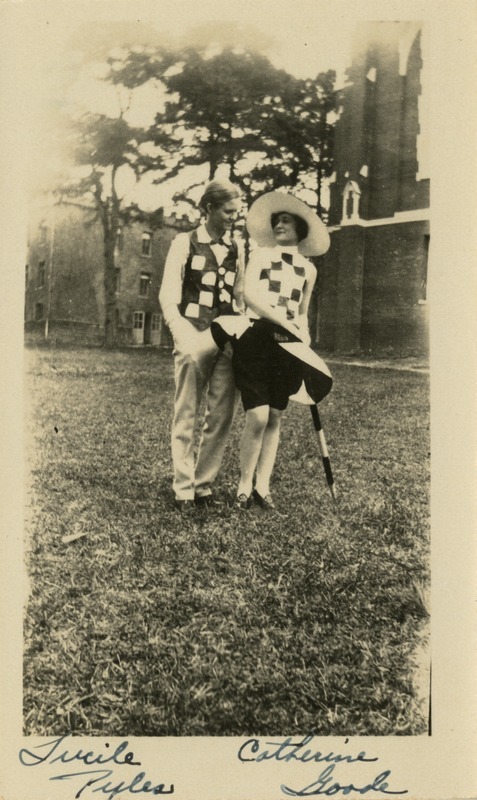 Bulletins were distributed yearly to each student and outlined the rules and regulations of campus, and now provide a glimpse into the life of FSCW students throughout the early 20th century. 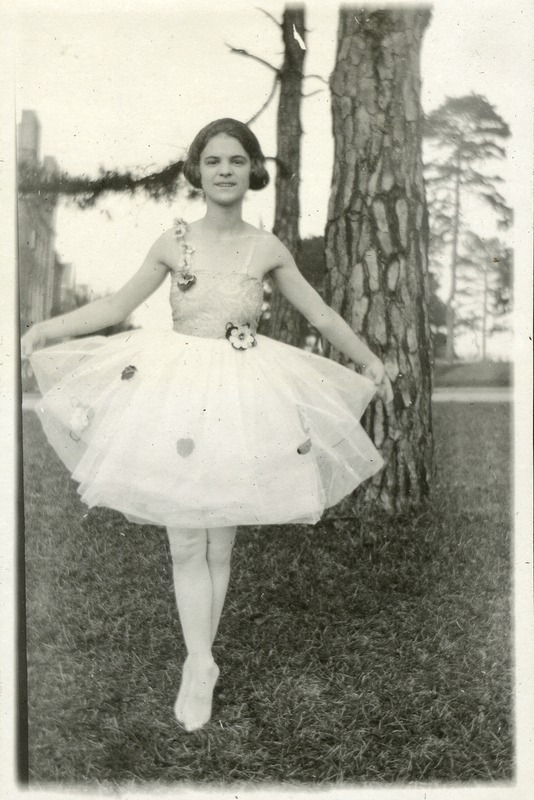 Prior to becoming Florida State University (FSU) in 1947, the Florida State College for Women was a bastion for educating women and encouraging them to live well-rounded lives, embodying the concept of femina perfecta (the perfect woman). The majority of the bulletins contain standard rules and practices that most students would expect nowadays, but some of the guidelines read downright draconian compared to modern standards. 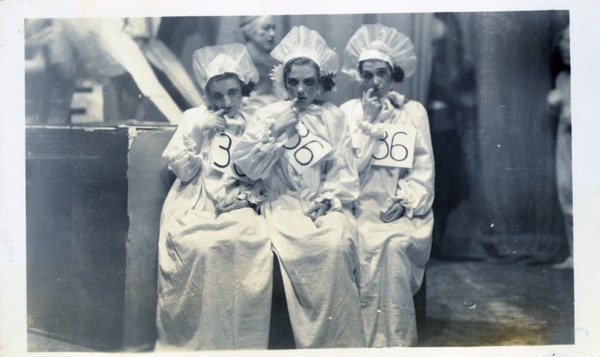 In a 1925-26 bulletin, the “Decorum” section states that “quiet, ladylike demeanor is expected at all times and in all places.” Students weren’t allowed to dry their hair in front of buildings, attend dances, play cards, roll down their stockings below their knees (or wear pants! ), smoke, and could only pick flowers on Mondays. On Sundays, church attendance was required, and “pianos and other musical instruments are not to be played… except as on other days, fifteen minutes before and fifteen minutes after meal time.” In that span of 30 minutes, don’t even think about playing rag or jazz music! The FSCW Student Government Bulletins can be viewed in the FSU Digital Library. To see more photographs, ephemera, and artifacts related to the history of Florida State, check out the FSU Heritage Protocol Digital Collections or like the Heritage Protocol Facebook page. This post was originally published February 13, 2015. 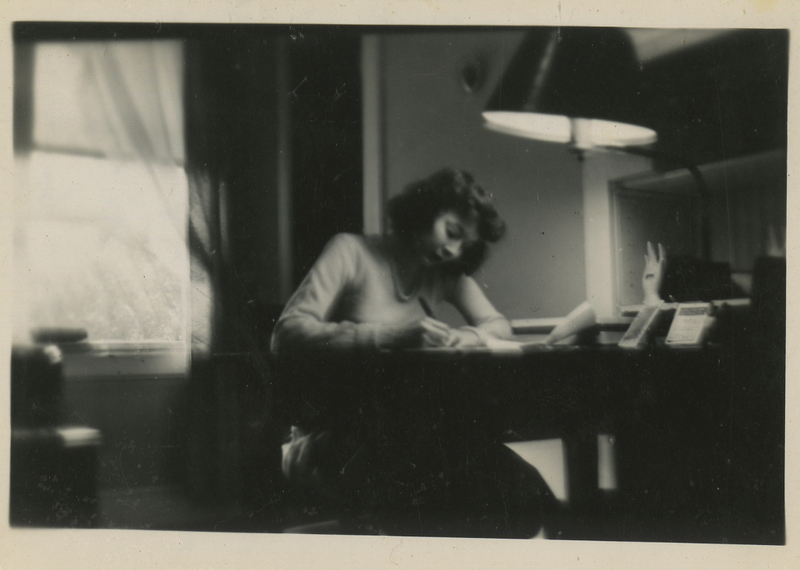 Frances Isaac writing a letter to her fiance Herbert Dotter, ca. 1945. 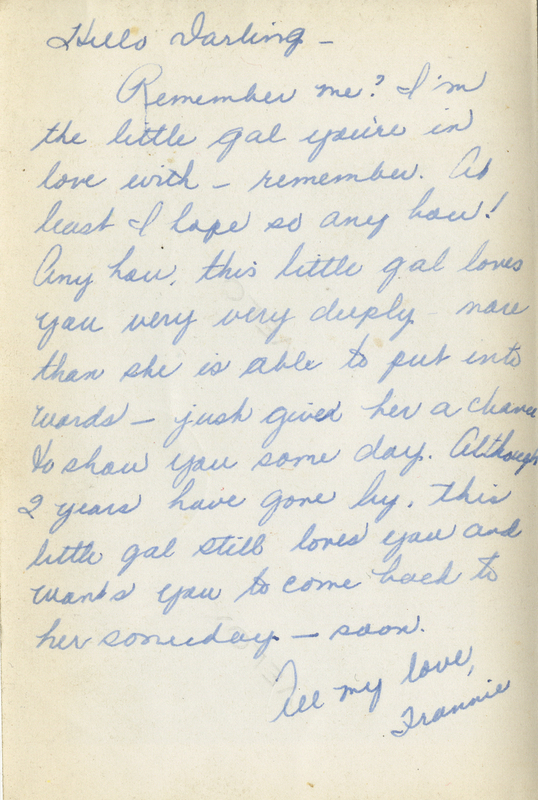 Much has been written about letters sent during World War II – movies and books chronicle the stories of undelivered correspondence found decades later, letters between young lovers parted by an ocean, advice from mothers and fathers to their sons. Last fall, Heritage Protocol and University Archives were excited to acquire a collection of letters and photographs sent by FSCW student Frances Isaac to her deployed fiance, Herbert Dotter. From 1944 through ’47, Frances “Frannie” Isaac sent hundreds of letters to her fiance who was stationed in Liberia during WWII. Notes written on the back of a photograph, ca. 1945. 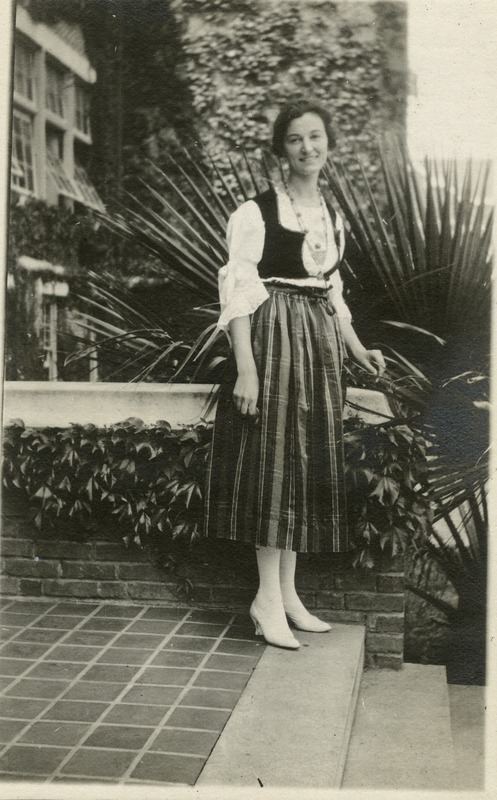 Frances started school at FSCW in 1943, and worked as an attache for the press in the Florida Legislator. She was an introvert, and often expressed in her letters that she preferred the solitude of studying in the library to gossiping with her classmates. In a letter from 1944, Frances wrote that she felt “pretty disgusted with the girls,” describing how her peers would gather at the gates of campus to talk to young military personnel. Many of the letters document the mundane, recounting what she ate for dinner that night, the new dresses she’d bought, difficult homework assignments. In some letters, she would talk about the multiple health ailments she faced, like a pulled tooth she had in 1946. Unfortunately, we only have half of the narrative from this epic love story. Not much is known about Frances Isaac after she graduated from FSCW. Herbert Dotter eventually married someone else, and passed away at the age of 92 in 2009. FSU’s campus during Thanksgiving is usually pretty quiet – students and staff are visiting their families over the break, or maybe traveling for the annual FSU vs. UF game, or others might be holed up in their dorm room and getting an early start on studying for finals. However, at FSCW, Thanksgiving week was bustling with events, which included presentations, band drills, a dance, and culminated with Florida State’s original rivalry – the annual Odd-Even basketball game. 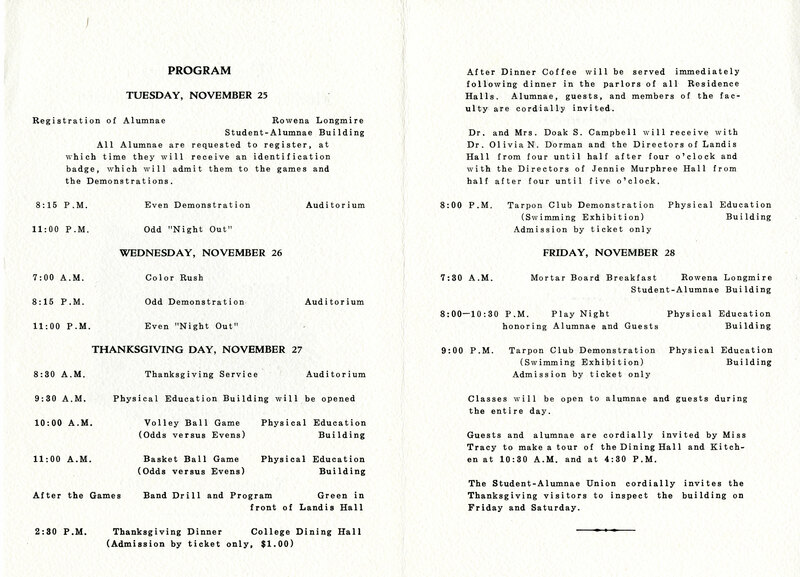 Festivities surrounding Thanksgiving became so enormously popular that college officials designated the entire week as Homecoming in 1926. The first event, a tradition that started in 1913, was the Color Rush. At the beginning of the week, selected students would race around the school and “capture” buildings by affixing ribbons in their class colors to the highest point (and later on, the front doors, due to safety concerns). Odd class colors were red, white, and purple, and the Even classes adopted green and gold. The fountain at Westcott was designated “Forever Odd,” because it was gift from the 1915 and 1917 classes. Similarly, the entrance arch was declared “Forever Even,” and was gifted by the classes of 1916 and 1918. The Color Rush began at the morning bell, and traditionally Dr. Ralph Bellamy would start the race not with a whistle, but his shotgun – ready, set, BOOM! Many of the events revolved around the intense rivalry between the Odds and Evens, the groupings of the odd and even graduating classes. 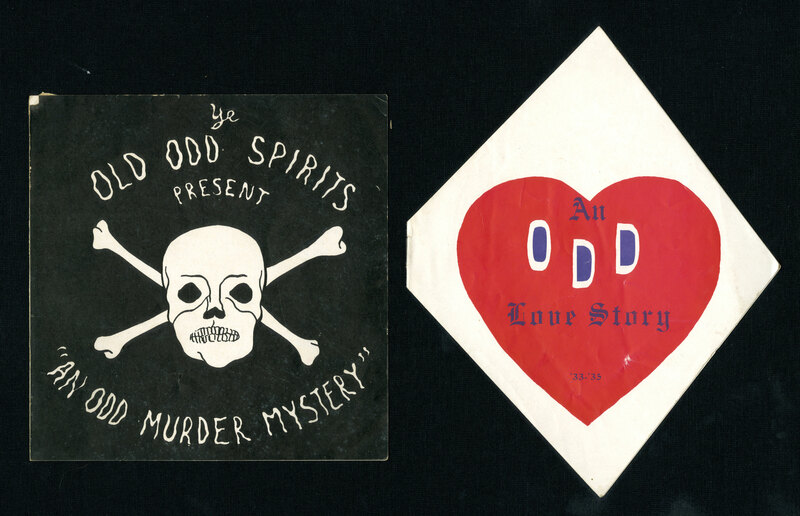 Each side developed their own songs, cheers, and even had their own honorary societies – Spirogira (Odd) and Esteren (Even). 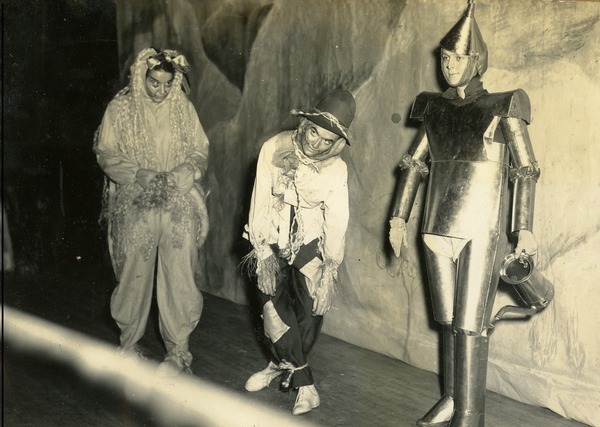 Elaborate student productions, called demonstrations, were held by each group, complete with costumes, musical numbers, and dancing. Nothing was more popular than the Odds vs. Evens basketball game. 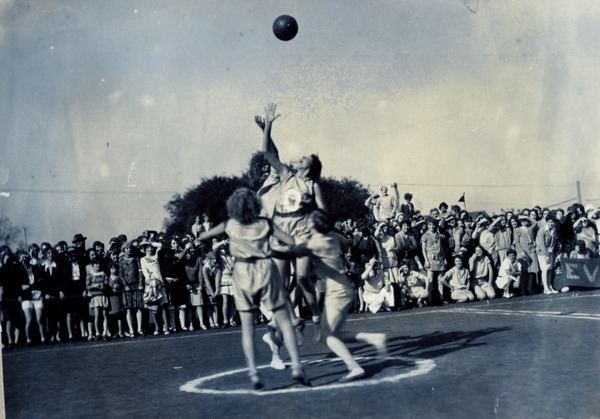 This event, one of the few times that women at the school could participate in athletic competition (as FSCW officials did not think competitive sports were ladylike), became so popular that in 1924 Katherine Montgomery added a volleyball game to the day’s activities. Thanksgiving activities culminated with a dinner on Thursday night. Admission to the dinner cost about $1 for students, and was an elaborate feast that was enjoyed by all. 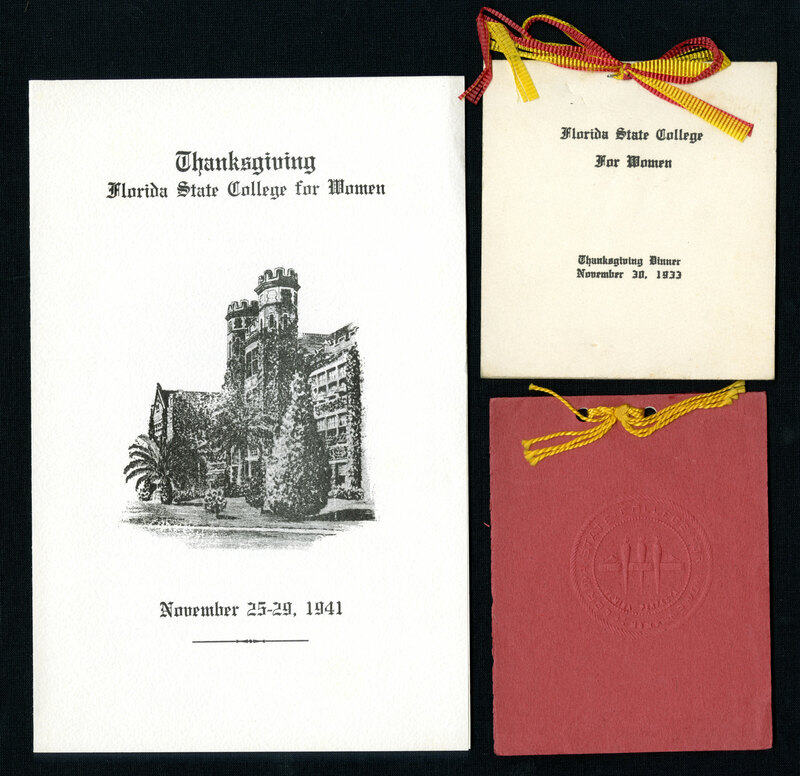 We here at FSU Special Collections & Archives wish everyone a safe and happy Thanksgiving holiday. We will be closed Thursday, November 27 and Friday, November 28. We resume our normal operating hours on December 1. 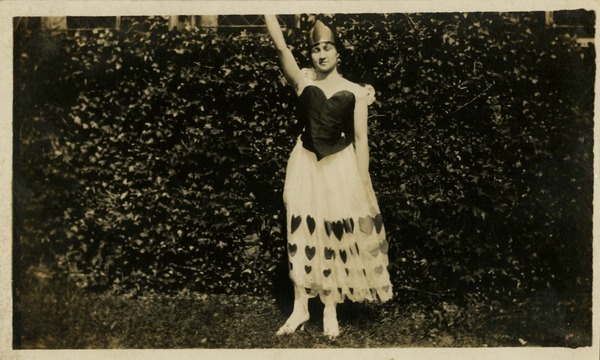 Happy Halloween from FSU Special Collections! The students at FSCW loved a good costume, and didn’t feel the need to wait until Halloween to dress up, often getting gussied up for class demonstrations, club initiations, or just because they wanted to have some fun. Please enjoy some photographs of FSCW students in costume! 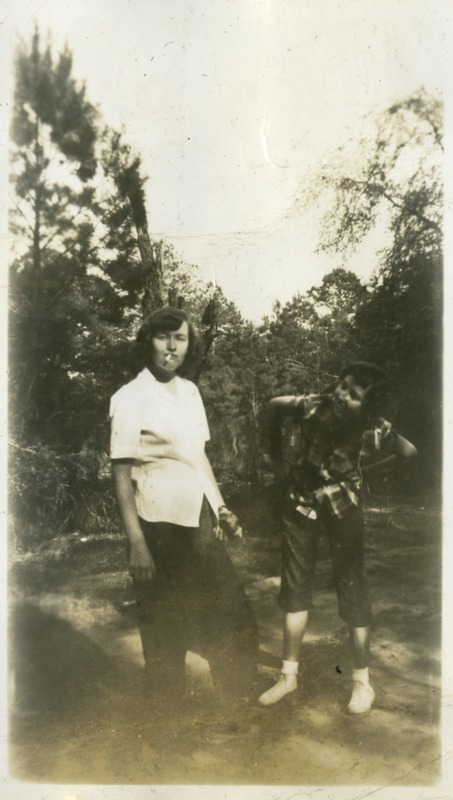 If you like these photographs, be sure to check out our latest exhibit “That I May Remember: Scrapbooks of the Florida State College for Women 1905-1947” in the Special Collections & Archives Gallery, open Monday-Friday 10AM-6PM. The Special Collections & Archives graduate assistants, Rebecca L. Bramlett and I, are busy preparing for the opening of our exhibit next Wednesday, October 15th. 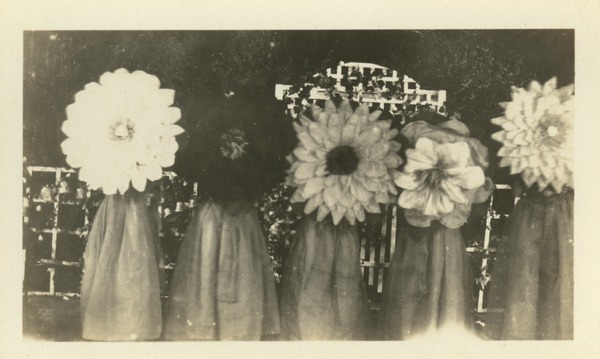 “That I May Remember: the Scrapbooks of Florida State College for Women (1905-1947)” showcases many of the scrapbooks from the Heritage Protocol & University Archives’ collections and explores the scrapbook as a means of communication, focusing on the themes of school spirit, friendship, and creating self. With each scrapbook we opened, Rebecca and I were struck by the way the unique personalities of the women of FSCW jumped off the pages at us. As a whole, the FSCW scrapbooks provide an invaluable insight into what student life was like at one of the largest women’s colleges in the country – a college with rigorous academics, zealous sporting traditions, vibrant community life, and even secret societies. Individually, they present a visual narrative of each student’s college journey, as seen through her own eyes. Which got me thinking… As a means of creating and communicating self, the FSCW scrapbooks operate in much the same way that popular forms of social media do for students today. Wall posts, friends, messages, memes, event invitations, and “likes” – these conventions are not reserved for the twenty-first century. Many of the FSCW scrapbooks, like Laura Quayle Benson’s (pictured right), contain autograph pages signed by the scrapbook creator’s friends. Like a Facebook wall, these pages list a person’s friends along with personal notes from each of them. 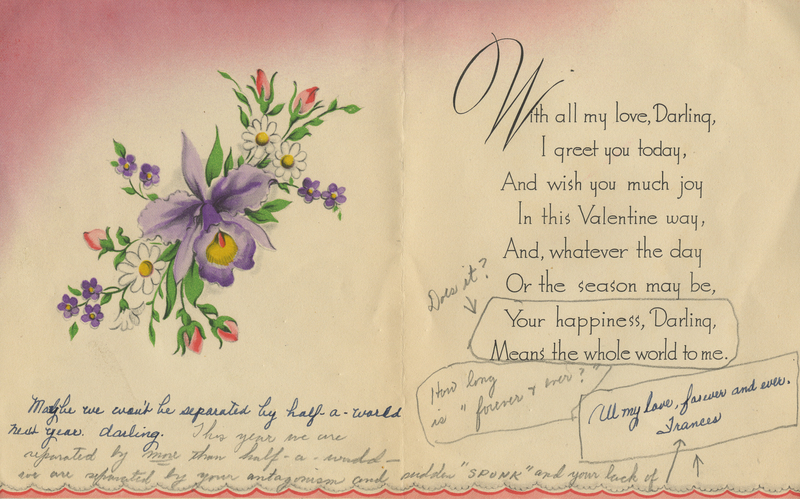 Some of the notes seem to be the generic words of a passing acquaintance (“With best wishes”), while others are rich with suggestions of inside jokes (“I love Laura ‘heaps’ – I wonder if (?) does?”). The scrapbooks are full of other forms of communication between friends and family – letters, notes, calling cards, package slips, greeting cards, and telegrams. Invitations to join sports teams, honor societies, and sororities are given pride of place as signs of belonging to a group, and collections of event programs read like a personal news feed of where each girl was on a given date. Flipping through the FSCW scrapbooks is a bit like scrolling through each girl’s Facebook wall. It gives one a sense of who she was at a certain point in her life – who she was friends with, what she did, what her interests were – even if the deeper, more personal meanings of the scrapbooks are sometimes obscured from the outside observer. Creating a scrapbook is an act of curation – carefully selecting texts and images and arranging them in a meaningful way. 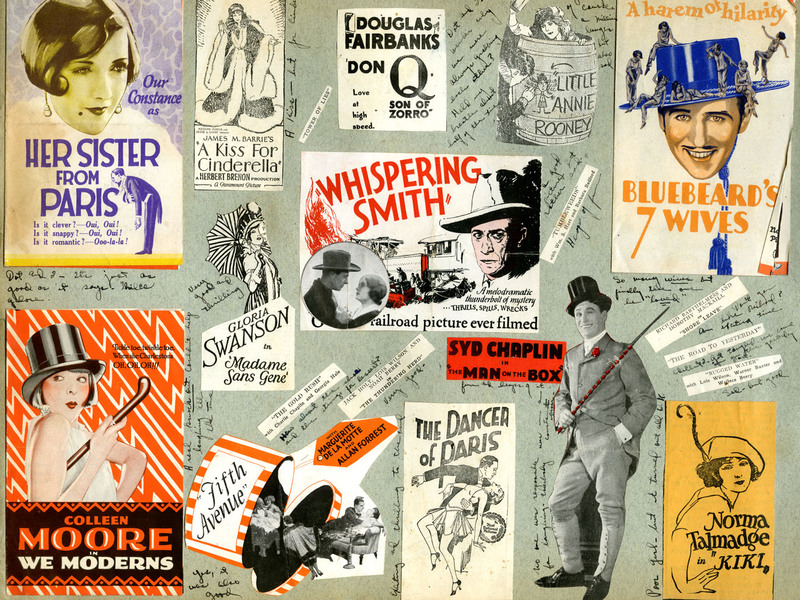 Although the creators of scrapbooks manipulate physical objects, users of sites like Pinterest and Tumblr use digital media to create collections of text, image, video, and sound meant to express something of themselves. The scrapbook of Annie Gertrude Gilliam (pictured left) contains many excellent examples of well-curated pages. Her clippings from advertisements, theater bills, and magazines are carefully arranged and replete with lively commentary (“A real knock out,” “Exciting and thrilling to the end”). 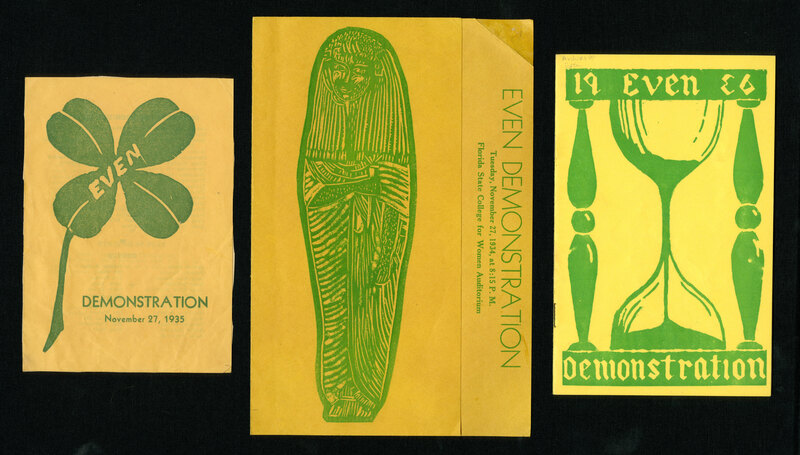 These pages speak of a timeless need to organize our thoughts, express ourselves visually, and voice our opinions, whether in a private scrapbook or a public webpage. 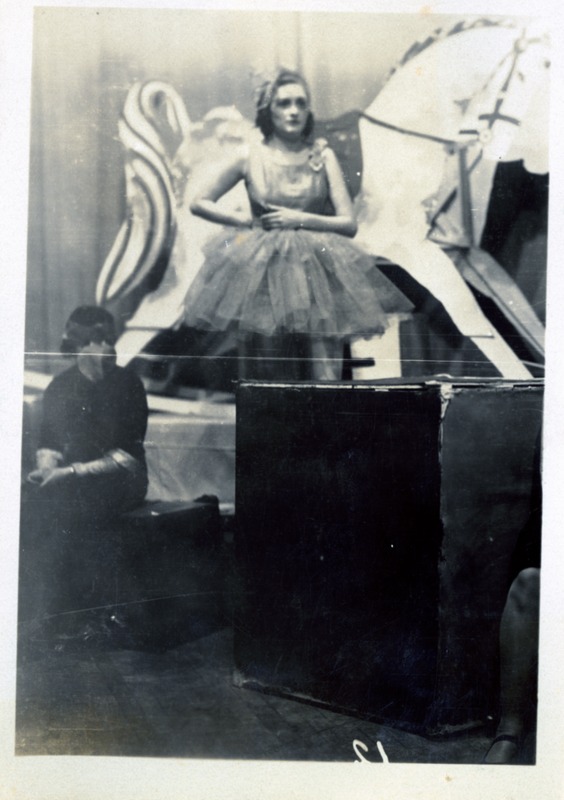 Photographs are a common feature of almost all of the FSCW scrapbooks, and many of these photos include captions written by the scrapbook’s creator, such as those by Jewell Genevieve Cooper (pictured right). Photos in scrapbooks are, in a sense, “tagged” by the scrapbook creator. 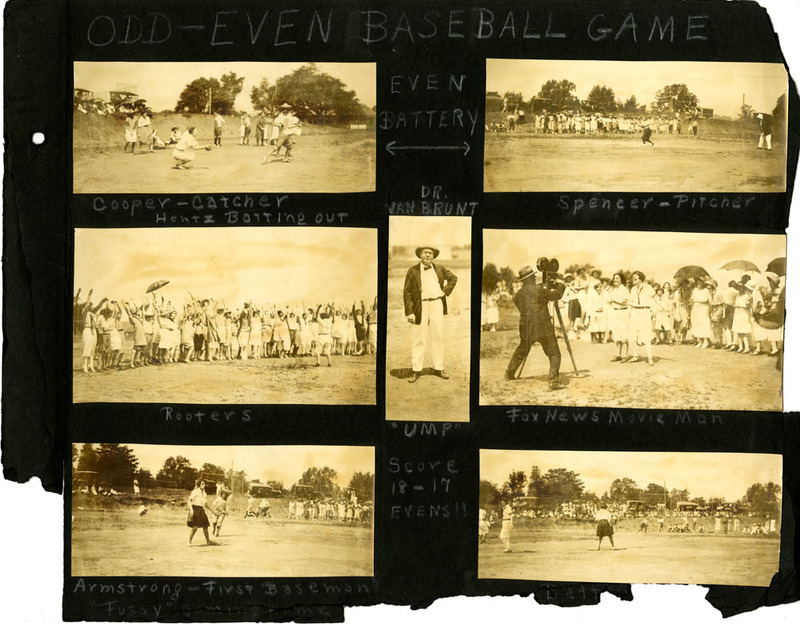 Jewell Genevieve Cooper’s “tags” tell us what the photos are of (an Odd-Even baseball game, one of FSCW’s wildly popular inter-school rivalries) and who is in them. These social layers added to photographs in scrapbooks are similar to the tags and descriptions users add to photos in social media sites like Instagram. Even though a picture says a thousand words, we can’t seem to resist adding our own words anyway. The FSCW scrapbooks give a unique window into student life as told by the students themselves. While the scrapbooks present plenty of cataloging and preservation challenges for archivists, they are at least physical objects that can be stored and displayed as such. Students today are also telling their own stories, but they are doing so through social media sites like Facebook, Tumblr, Pinterest, and Instagram. How these stories will be preserved and shared with future generations remains to be seen and is a question beyond the scope of this blog post. In the meantime, “That I May Remember: the Scrapbooks of Florida State College for Women (1905-1947)” will be on display in the Strozier Library Exhibit Space from October 15th through December 1st.